It all started with Jesse and Ciaran. Growing up together in Ballymore Eustace in the 80's was a good time. And music was everywhere. We had our first band together by secondary school (chicks dig musicians right?) and we've been playing together ever since. Now we've played thousands of gigs, together and in different groups. We decided to put together The Suitcase Trio to take wedding music to the next level. Call Jesse on 0879008417 or email thesuitcasetrio@gmail.com for a quote. 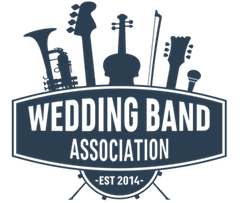 The Suitcase Trio are proud members of The Wedding Band Association. Book your band with confidence. The Suitcase Trio are members of WeddingBandSuppliers.ie. We promise to keep the dancefloor full and keep everyone in party mode for the most important part of the night.... the dancing! Jesse is a highly experienced DJ with over 1000 weddings under his belt. He only uses the very best in sound and lighting equipment and has a massive selection of music to keep your dancefloor full all night. Have a listen to our recent podcast interview on weddingsuppliers.ie. We discuss all things music related for planning your wedding. From first dances to set-lists, it’s worth your time if you’d like an insight into how we do things. Here’s the link….